Hotel ibis budget Weimar Nohra. Book online now! Free Wifi! 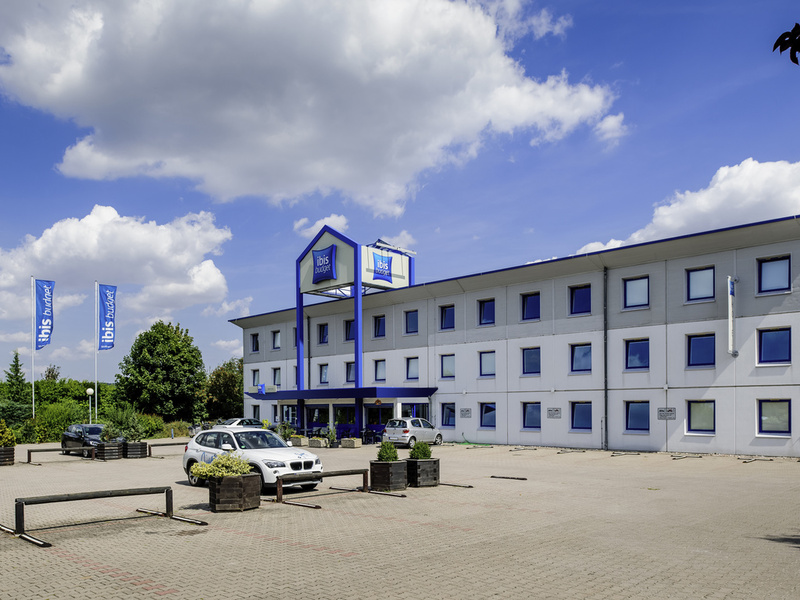 The ibis budget Hotel Weimar Nohra is just 10 minutes from the city center and is quick and easy to reach from the A4 highway. Stay in one of the 67 modern rooms, each of which is equipped for up to two adults and 1 child under the age of 12. Enjoy free W IFI access and parking at the hotel. Start your day with our delicious buffet breakfast. The hotel is good located between Weimar and Erfurt. Both cities are reached in a few minutes (car req). However, the location itself is more pratical than comfortable and sourounded by industry between a petrol station and a car dealer. It is a hotel in the standard style of Ibis Budget but from the last generation. If you are looking for a night stayover on a long distance trip, it's perfect. I would not recommend it for a weekend trip. Fit for purpose for overnight stop on lengthy travel. We stayed in the hotel forth time as we traveling every year.Always been nice welcome at the recepion.Great quiet area. Will Never return to this particular hotel. No much to say - just needed a place to stay overnight - was good enough for me. The hotel is "old" Etap style but no real issue as far as I am concerned. Good value proposition, in the middle of an industrial zone. Definitely utilitarian. We arrived after 10pm and it was a pleasure to be able to register at the entrance via the computer and receive the entry code with no problem. Very nice system and it worked just perfectly. The breakfast was more than sufficient. The bed was comfortable and the room was sufficiently warm on a cold night. The location is good, as it is close to the A4 autobahn. The only thing that I wish would change is that IBIS supply better pillows. This is the 3rd time I have stayed in an IBIS budget hotel and each time the pillows are not hard enough for me. It is like sleeping on no pillow at all, so I have to fold it in two to make it firmer. We were very happy to stay at this hotel for one night. The room was clean, comfortable and quiet. The staff at the reception was friendly and helpful. The spread of breakfast was indeed great. So overall, we felt that this was great value for the cost. Nice, friendly staff,clean and tidy! Upon arrival receptionist so polite and friendly.Very nice hotel so kids was happy also. Was absolutely fine apart from the codes on the doors didn't work every time. The rooms were clean &amp; the breakfast was basic but ok.
Value for money, good service when present. Bathroom like prison cell. 15 min walk from train station. My first room smelled like smoke, but I got a new one at once without any problems, as I was lucky enough to check in when staff was present. The rooms are spacious, but the bathroom looks like a prison cell. The was basin is in the bedroom. Adequate breakfast buffet, the only inconvenience is that the vending machines in the hall only accept coins. Stayed one night, all ok, room clean etc. quite, would use again.